¡No Pasarán! : Typical MSM Headline? "Clinton wants to move past email scandal, but voters can't seem to"
Typical MSM Headline? 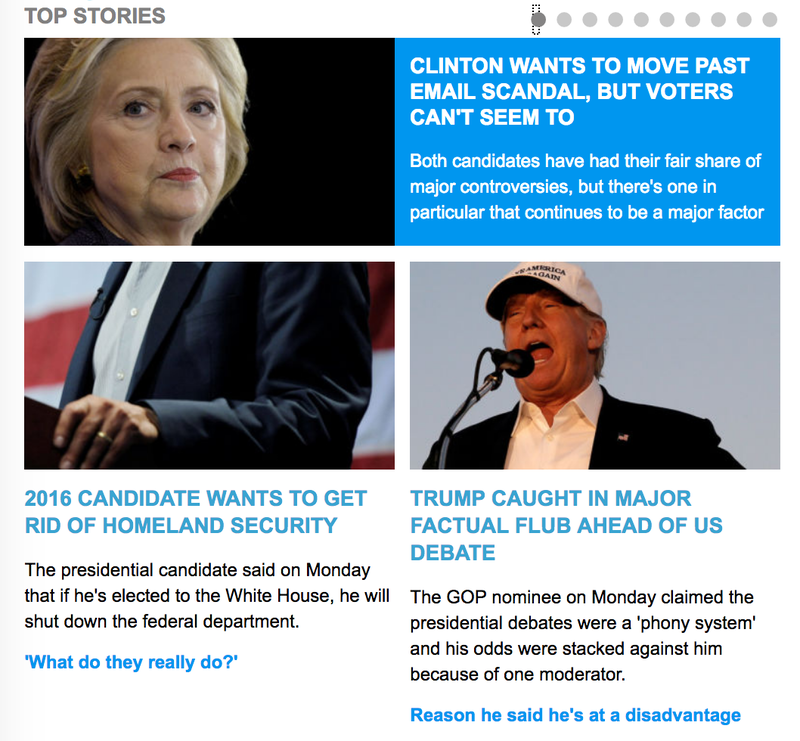 "Clinton wants to move past email scandal, but voters can't seem to"
On its contents page, AOL links to the news stories with major developments regarding all three presidential candidates. You don't even have to read the stories; just check out the headlines. That's right: Compare the AOL headlines for the news story on the Democrat candidate with those concerning the Republican and the Libertarian candidates. Like with Barack Obama, it's too bad that the American people let the Democrat leader down and that it cannot be dissolved for another to be elected. Indeed, in the tradition of putting the onus on the (evil or at least unsportsmanlike) GOP — the ol' Republicans pounce angle — and/or on the (clueless) voters, Grant Suneson seems to bemoan that, given that Bill Clinton's enlightened wife wants to move forward, the clueless voters can't act like grown-ups and turn a blind eye to a largely irrelevant scandal in order to focus on more pertinent subjects. And what might those pertinent subjects be? Well, one might be Trump Caught in Major Factual Flub Ahead of US Debate. Another might read, say, 2016 Candidate wants to get rid of the Department of Homeland Security. So what does a "Major … Flub" refer to? It's to the fact that Trump calls first US debate moderator a Democrat; records show otherwise. Indeed, NBC's Lester Holt, we learn, happens to be a registered Republican. Now, right there, we have one paramount sin, obviously of the unforgivable type. What a "Major … Flub" does not refer to is such things as being sneaky and secretive while lying about your four years at the head of one of the branches of government. Moreover, the Matt Picht story, Gary Johnson wants to get rid of the Department of Homeland Security, is sold on the "contents" page anonymously (as 2016 Candidate wants to get rid of the Department of Homeland Security) — probably for no other reason than the third party candidate being not well enough known in person to command interest as well as clicks. However, notice that the photo (clearly, of a man in a man's suit) and the subhead with twice the word "he" ("The presidential candidate said on Monday that if he's elected to the White House, he will shut down the federal department") obviates any chance that the candidate in question could be Hillary while implying somewhat that it might, just might, be The Donald. Let's hope this can be attributed to nothing else but paranoia on this reviewer's part.